Sometimes going with the flow is better than making definitive plans always so far ahead of time. There is something about letting the meeting place organically appear in front of you. People I met last year through the Canadian Embassy in the UAE contacted me & asked if we would like to tour around Abu Dhabi. We’ve only met them once but decided to meet up with them. We had the most incredible day touring The Grand Mosque, the Louvre, having high tea at the Emirates Palace & then a traditional fish dinner at an Iraqi restaurant. We know we’ve made new friends with our generous & friendly tour guides. He was a walking encyclopedia for the UAE. We learned so much & had a wonderful day. I’m so glad we have not planned every second of everyday. Leaving time for the spontaneous can be the most satisfying adventure. 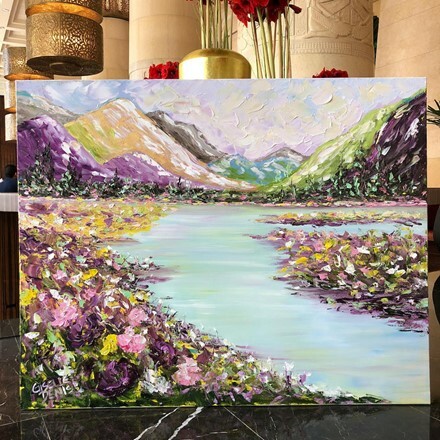 This piece was painting at the Raffles Hotel duding my residency in Dubai.